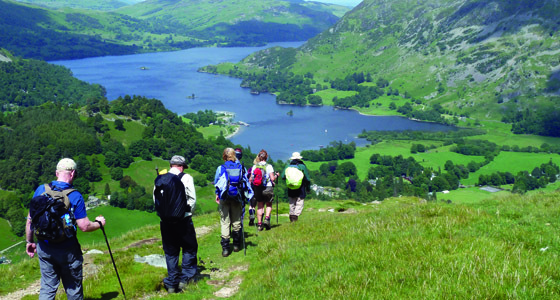 This classic Coast to Coast walking route was originated and described by A. Wainwright, author of a well-known series of mountain-walking guide books on the Lake District. The walk starts on the Irish Sea coast of Cumbria near the huge red sandstone cliffs of St. Bees Head. You cross three National Parks before reaching the North Sea at the pretty fishing village of Robin Hood’s Bay on the rocky coastline of the North York Moors. Tradition has it that you dip your boots in the Irish Sea and take a pebble to deposit in the North Sea at the end of your Coast to Coast walk. That should confuse geologists a few thousand years hence. The first few days take you over some of the most rugged and beautiful terrain of the Lake District by way of the idyllic lakeland valleys of Borrowdale, Grasmere (Wordsworth lived here) and Patterdale, close to Ullswater Lake. You pass Helvellyn, England’s most popular mountain, and the mountain oddly named High Street, along which the Roman Legions marched on their way to Hadrian’s Wall. After leaving the Lake District you cross a gentler landscape round Shap and Orton. 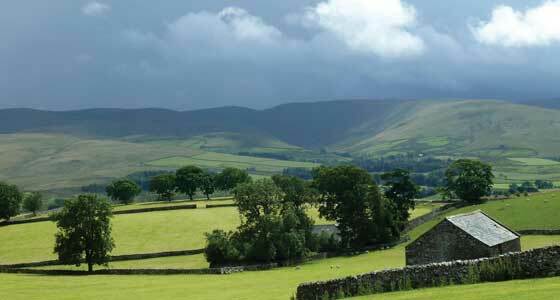 Beyond the quaint market town of Kirkby Stephen you enter the Yorkshire Dales National Park. Two days are then spent walking through the long valley of Swaledale, with its dry stone walls and unspoilt villages. You reach the historic town of Richmond with cobbled streets, sloping market square and famous castle perched above the River Swale. Beyond the arable farmland of the Vale of York, you ascend onto the heather moorlands of the North York Moors, a region of long vistas and easy walking. After crossing the wooded valley of Eskdale you reach the dramatic cliffs of the North Sea Coast. The last few miles of the Coast to Coast walk follow the scenic clifftop path to the red-roofed village of Robin Hood’s Bay. With an extra night here, you can relax on the beach or visit nearby Whitby with its ruined abbey (associated with the Dracula legend) and its Captain Cook Museum. 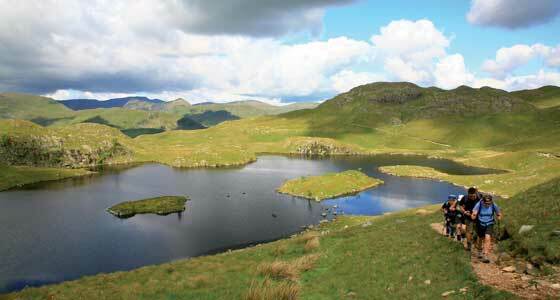 We recommend undertaking the Coast to Coast walk when it is late spring or summer in the UK (April – September). The climate of northern England is variable with rainfall occurring throughout the year (though more likely from October to April). The sunniest month is July and average temperatures between April and October range from 4°C (39°F) to 19°C (67°F), although it may be slightly cooler on the higher sections of the trail. 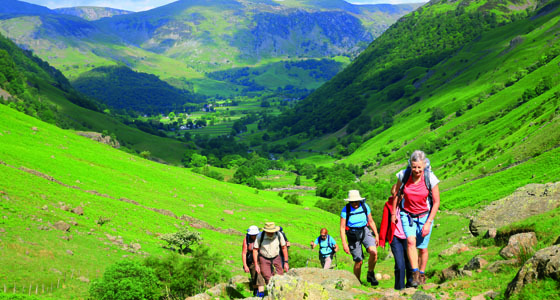 The Coast to Coast walk is one of the most iconic long-distance walks in England and as such our Coast to Coast walking holidays are graded Moderate to Challenging, including some long days and steep climbs. We recommend allowing at least 15 days to complete the entire Coast to Coast walk. If you would like to slow things down a little and take in your surroundings a bit more along the way, then 17 or 18 days should be a good amount of time for you. 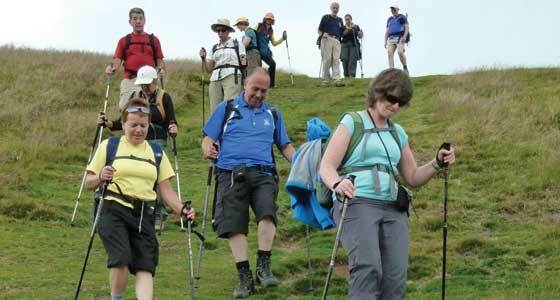 Walking the full route in one go is quite an undertaking and is not normally recommended for first time walkers. If you’re new to walking, restricted by time or would just like to take it a bit easier, you can also break up the walk into two very manageable 8-11 day chunks. Sherpa Expeditions offer both self-guided and guided versions of the Coast to Coast walk, so that you can choose the style of travel and dates that best suit your interests. Self-guided Coast to Coast walks can depart any day from 1 April to 25 September, subject to availability and are 15, 16, 17, or 18 days of walking. 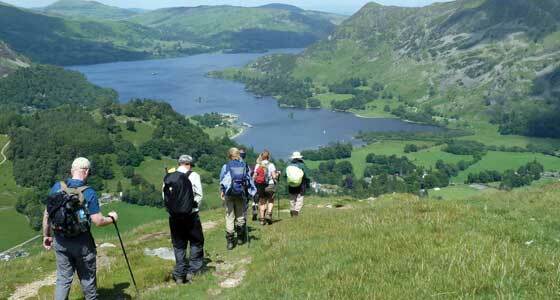 Guided Coast to Coast walks can be undertaken in 15 or 17 days. The 15-day trip has 2 departures - one in June and one in August, whilst the 17-day trip departs in May, July, August and September. 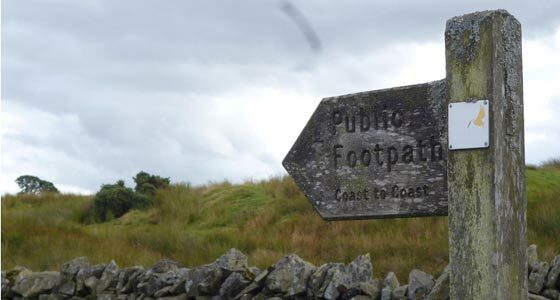 Wainwright’s “Coast to Coast” walk has long been a classic, and it was perhaps inevitable that cyclists would also look at interesting ways of crossing beautiful, scenic northern England. The original cycling route was thus developed by ‘Sustrans’ ‑ a charitable organization aiming at the development of sustainable transport networks in the U.K. They took minor roads and rideable ‘off road’ bridleways that could be used to thread together small towns and country areas across Cumbria, the Pennines, through the River Wear watershed and onto the more urban parts of the North East. The route so created is called the “C2C,” literally “Sea to Sea,” to differentiate it from the “Coast to Coast” walk which covers an altogether different route and embraces different scenery. The original ‘C2C’ stretches from the lighthouse at Whitehaven on the Irish Sea to the lighthouse at Sunderland on the shores of the North Sea. Our team has prepared for you a fantastic 6-day Coast to Coast cycling holiday following a slightly alternative route. Ride across England from the Irish Sea at Whitehaven to Tynemouth on the North Sea, crossing the Lake District and Pennines. 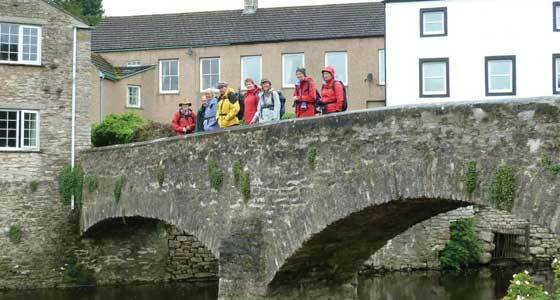 The Coast to Coast walk traditionally starts in St. Bees and finishes in Robin Hood’s Bay. To get to St. Bees from by train you will first need to get a train to Carlisle (3.5 hours from London Euston) and then a local train from Carlisle to St. Bees (1 hour 15 mins) and a short walk from station to hotel. On finishing the journey you will need to take a bus or taxi from Robin Hood’s Bay to Scarborough and then you can get a train from Scarborough to London (3 hours). Visit The Trainline if you would like to look at the journey involved. If you're looking for some more inspiration, reviews and information on walking or cycling the Coast to Coast route we have prepared a number of articles in our blog, which contain loads of pictures, tips and advice from our guides and travellers in what you can expect. You can also check out our Coast to Coast Walk album on our Facebook page.